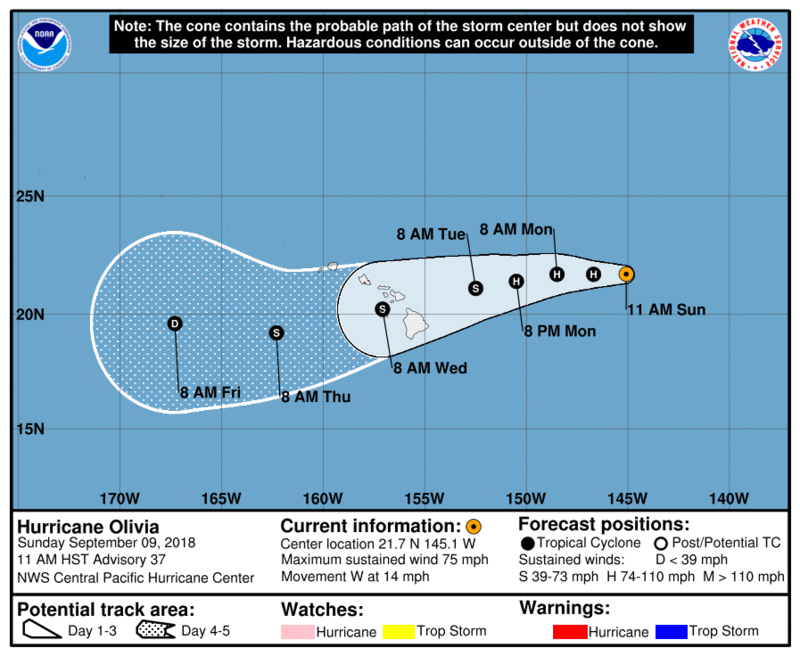 Tropical Storm Olivia, Wednesday, Sept. 12, 2018, 7 a.m. The Central Pacific Hurricane Center reports that Tropical Storm Olivia continues to dissipate as it moves west across Maui. 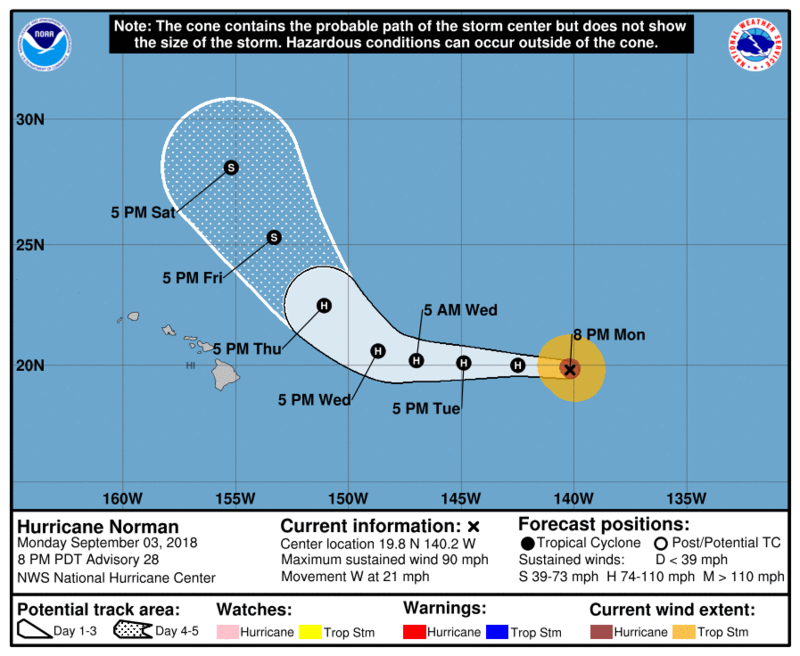 Although the tropical storm threat has passed, Hawai‘i Island remains under a Flash Flood Watch and isolated heavy rain and thunderstorms could still occur. A High Surf Advisory is also in effect for the east-facing shores of the island. All Hawai‘i County parks are open except for Spencer Beach Park, which is closed until Friday for routine maintenance. All schools and roads on Hawai‘i Island are open at this time. A Flash Flood Watch is in effect until until Thursday evening. At 5 a.m., Tropical Storm Olivia was located 55 miles NNE of Kahului, Maui, movement is toward the west at 12 mph with maximum sustained winds of 45 mph. Tropical Storm Olivia has weakened during the night and the Central Pacific Hurricane Center forecasts this weakening to continue. 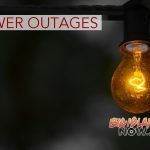 Hawai‘i County police, fire, and state and county road crews reported no problems occurring in any of the districts of Hawai‘i Island as monitoring continued throughout the night. Due to the location of the storm, emphasis of monitoring was focused in the Hāmākua, Kohala and North Kona Districts. No problems occurred during the night. 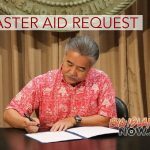 The Department of Education reports all schools are open on Hawai‘i Island today, including all afterschool activities. Police and road crews report all roads are clear and open. A Tropical Storm Warning is in effect for Maui County and O‘ahu. The center of Olivia is just off the northern coast of Maui, 25 miles ENE of Kahului, moving west near 10 mph. A turn toward the WSW is expected today, with an increase in forward speed. This general motion is then expected to continue the next couple of days. Maximum sustained winds are near 45 mph with higher gusts. Some weakening is forecast during the next 48 hours. Tropical-storm-force winds extend outward up to 90 miles from the center. WIND: Tropical storm conditions are expected in Maui County today. Tropical storm conditions are expected to begin over O‘ahu later this morning. Wind gusts can be much stronger near higher terrain, and in the upper floors of high-rise buildings. Winds can also be especially gusty through gaps between mountains and where winds blow downslope. SURF: Large swells generated by Olivia will impact the main Hawaiian Islands through tonight. This will result in dangerously high and potentially damaging surf, mainly along exposed east facing shores.